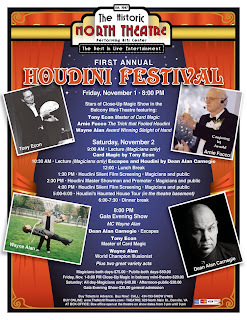 This weekend, November 1-2, 2013, Wayne Alan and The North Theatre in Danville VA will be hosting the first annual Houdini Festival. It's going to be a fun time and yours truly will be there on November 2nd lecturing and then later performing. At 10:30am I will be doing a lecture on Escapes. I'll teach some methods used by Houdini and also some techniques by others. I'll be teaching methods to escape from Ropes and Handcuffs as well as some unusual escape methods. At 8pm, there will be a Gala Evening Show and I will be doing my Steampunk Magic Act along with some escapes thrown into the mix. 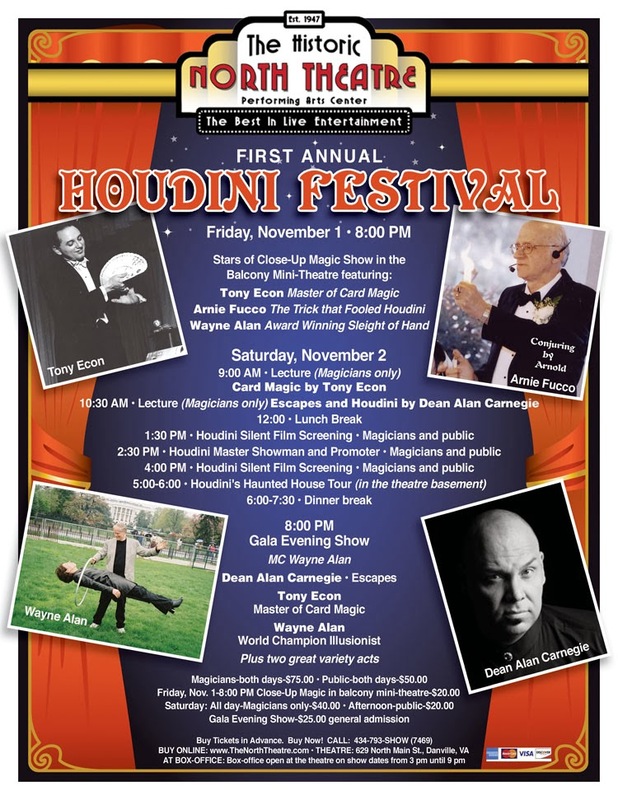 If you are in Southern Virginia, or perhaps the Northern part of North Carolina and have an interest in magic and Houdini, please come on out. Click on the poster above to find out more about the festival! I will have a full report of the Festival once it's over!